“US sizes vs. Metric Sizes"
It is important to have a good understanding of knitting needle sizes if you want to enjoy success with knitting. The needle's determines how big the stitches will be. The gauge, or how many stitches there are per inch, largely depends on the size of the needles. Having the correct gauge is all-important in making sure your knitting project turns out right. In fact, knitting patterns often recommend a certain sized needle, but then include an instruction that says use whatever needle size will give you the correct gauge. 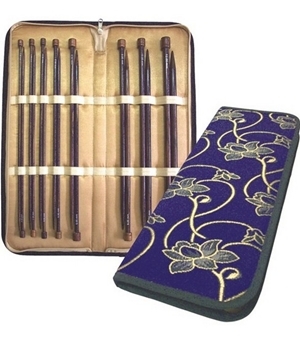 Knitting needle sizes as they are shown on patterns refer to the needle diameter. There are also different lengths of knitting needles. The length of needle required depends on the project, with things like shawls and large garments requiring long needles to hold all the stitches. Small items such as hats and socks can be made on shorter needles. There is no one worldwide system for numbering of knitting needle sizes. There is a U.K. and Canadian system, a Japanese system, a U.S. system, and a metric system. In the metric system, the needle size is the diameter of the needle in millimeters. This means that a lower number needle size means a smaller needle. The American system also uses a lower number = smaller size numbering scheme. However, in the U.K. and Canadian system, lower number = larger size needle. You can see why it's important to know which system is indicated when reading a pattern. Bigger needles create bigger loops and therefore make big stitches. Small needles make smaller loops and are used for work with fine details, lace elements, etc. Choosing knitting needle sizes based on the wrong numbering scheme could result in wildly varying results. To get an idea of how these various size numbers compare, let's take a look at some equivalents. metric 3.25 equals U.S. 3.
metric 25.0 equals U.S. 50 There are charts that show the equivalent knitting needles sizes in both systems. Some charts also show the U.K./Canadian and Japanese knitting needle sizes. These charts are available on many knitting websites. Some people like to print them out in order to keep them with their knitting supplies for reference. Conversion charts come in very handy for those times when you find a pattern that you like, but it shows unfamiliar knitting needle sizes. One of the joys of knitting is finding an old or unusual pattern. Now you don't have to shy away from a pattern simply because it shows a metric needle size. The chart below is to help you but is not exact. The tension square is very important in choosing needles or hooks.